For other uses, see Slide rule (disambiguation). The slide rule, also known colloquially in the United States as a slipstick, is a mechanical analog computer. The slide rule is used primarily for multiplication and division, and also for functions such as exponents, roots, logarithms and trigonometry, but typically not for addition or subtraction. Though similar in name and appearance to a standard ruler, the slide rule is not meant to be used for measuring length or drawing straight lines. Slide rules exist in a diverse range of styles and generally appear in a linear or circular form with a standardized set of markings (scales) essential to performing mathematical computations. Slide rules manufactured for specialized fields such as aviation or finance typically feature additional scales that aid in calculations peculiar to those fields. At its simplest, each number to be multiplied is represented by a length on a sliding ruler. As the rulers each have a logarithmic scale, it is possible to align them to read the sum of the logarithms, and hence calculate the product of the two numbers. The Reverend William Oughtred and others developed the slide rule in the 17th century based on the emerging work on logarithms by John Napier. Before the advent of the electronic calculator, it was the most commonly used calculation tool in science and engineering. The use of slide rules continued to grow through the 1950s and 1960s even as computers were being gradually introduced; but around 1974 the handheld electronic scientific calculator made them largely obsolete and most suppliers left the business. In its most basic form, the slide rule uses two logarithmic scales to allow rapid multiplication and division of numbers. These common operations can be time-consuming and error-prone when done on paper. More elaborate slide rules allow other calculations, such as square roots, exponentials, logarithms, and trigonometric functions. Scales may be grouped in decades, which are numbers ranging from 1 to 10 (i.e. 10n to 10n+1). Thus single decade scales C and D range from 1 to 10 across the entire width of the slide rule while double decade scales A and B range from 1 to 100 over the width of the slide rule. In general, mathematical calculations are performed by aligning a mark on the sliding central strip with a mark on one of the fixed strips, and then observing the relative positions of other marks on the strips. Numbers aligned with the marks give the approximate value of the product, quotient, or other calculated result. The user determines the location of the decimal point in the result, based on mental estimation. Scientific notation is used to track the decimal point in more formal calculations. Addition and subtraction steps in a calculation are generally done mentally or on paper, not on the slide rule. Most slide rules consist of three linear strips of the same length, aligned in parallel and interlocked so that the central strip can be moved lengthwise relative to the other two. The outer two strips are fixed so that their relative positions do not change. Some slide rules ("duplex" models) have scales on both sides of the rule and slide strip, others on one side of the outer strips and both sides of the slide strip (which can usually be pulled out, flipped over and reinserted for convenience), still others on one side only ("simplex" rules). A sliding cursor with a vertical alignment line is used to find corresponding points on scales that are not adjacent to each other or, in duplex models, are on the other side of the rule. The cursor can also record an intermediate result on any of the scales. Use the double-decade scales A and B. Use the folded scales. In this example, set the left 1 of C opposite the 2 of D. Move the cursor to 7 on CF, and read the result from DF. Use the CI inverted scale. Position the 7 on the CI scale above the 2 on the D scale, and then read the result off of the D scale below the 1 on the CI scale. Since 1 occurs in two places on the CI scale, one of them will always be on-scale. Use both the CI inverted scale and the C scale. Line up the 2 of CI with the 1 of D, and read the result from D, below the 7 on the C scale. Using a circular slide rule. Method 1 is easy to understand, but entails a loss of precision. Method 3 has the advantage that it only involves two scales. The illustration below demonstrates the computation of 5.5/2. The 2 on the top scale is placed over the 5.5 on the bottom scale. The 1 on the top scale lies above the quotient, 2.75. There is more than one method for doing division, but the method presented here has the advantage that the final result cannot be off-scale, because one has a choice of using the 1 at either end. CF, DF "folded" versions of the C and D scales that start from π rather than from unity; these are convenient in two cases. First when the user guesses a product will be close to 10 but is not sure whether it will be slightly less or slightly more than 10, the folded scales avoid the possibility of going off the scale. Second, by making the start π rather than the square root of 10, multiplying or dividing by π (as is common in science and engineering formulas) is simplified. The Binary Slide Rule manufactured by Gilson in 1931 performed an addition and subtraction function limited to fractions. , for example, locate x on the D scale and read its square on the A scale. Inverting this process allows square roots to be found, and similarly for the powers 3, 1/3, 2/3, and 3/2. Care must be taken when the base, x, is found in more than one place on its scale. For instance, there are two nines on the A scale; to find the square root of nine, use the first one; the second one gives the square root of 90.
and square it using the A and B scales as described above. Alternatively, use the rightmost 1 on the C scale, and read the answer off the next higher LL scale. For example, aligning the rightmost 1 on the C scale with 2 on the LL2 scale, 3 on the C scale lines up with 8 on the LL3 scale. The S, T, and ST scales are used for trig functions and multiples of trig functions, for angles in degrees. can be read directly from x on the S scale to the result on the D scale, when the C-scale index is set at k. For angles below 5.7 degrees, sines, tangents, and radians are approximately equal, and are found on the ST or SRT (sines, radians, and tangents) scale, or simply divided by 57.3 degrees/radian. Inverse trigonometric functions are found by reversing the process. Many slide rules have S, T, and ST scales marked with degrees and minutes (e.g. some Keuffel and Esser models, late-model Teledyne-Post Mannheim-type rules). So-called decitrig models use decimal fractions of degrees instead. Base-10 logarithms and exponentials are found using the L scale, which is linear. Some slide rules have a Ln scale, which is for base e. Logarithms to any other base can be calculated by reversing the procedure for calculating powers of a number. For example, log2 values can be determined by lining up either leftmost or rightmost 1 on the C scale with 2 on the LL2 scale, finding the number whose logarithm is to be calculated on the corresponding LL scale, and reading the log2 value on the C scale. Slide rules are not typically used for addition and subtraction, but it is nevertheless possible to do so using two different techniques. This method is similar to the addition/subtraction technique used for high-speed electronic circuits with the logarithmic number system in specialized computer applications like the Gravity Pipe (GRAPE) supercomputer and hidden Markov models. The second method utilizes a sliding linear L scale available on some models. Addition and subtraction are performed by sliding the cursor left (for subtraction) or right (for addition) then returning the slide to 0 to read the result. The width of the slide rule is quoted in terms of the nominal width of the scales. Scales on the most common "10-inch" models are actually 25 cm, as they were made to metric standards, though some rules offer slightly extended scales to simplify manipulation when a result overflowed. Pocket rules are typically 5 inches. Models a couple of metres wide were sold to be hung in classrooms for teaching purposes. Typically the divisions mark a scale to a precision of two significant figures, and the user estimates the third figure. Some high-end slide rules have magnifier cursors that make the markings easier to see. Such cursors can effectively double the accuracy of readings, permitting a 10-inch slide rule to serve as well as a 20-inch. Various other conveniences have been developed. Trigonometric scales are sometimes dual-labeled, in black and red, with complementary angles, the so-called "Darmstadt" style. Duplex slide rules often duplicate some of the scales on the back. Scales are often "split" to get higher accuracy. Circular slide rules come in two basic types, one with two cursors, and another with a free dish and one cursor. The dual cursor versions perform multiplication and division by holding a fast angle between the cursors as they are rotated around the dial. The onefold cursor version operates more like the standard slide rule through the appropriate alignment of the scales. The basic advantage of a circular slide rule is that the widest dimension of the tool was reduced by a factor of about 3 (i.e. by π). For example, a 10 cm circular would have a maximum precision approximately equal to a 31.4 cm ordinary slide rule. Circular slide rules also eliminate "off-scale" calculations, because the scales were designed to "wrap around"; they never have to be reoriented when results are near 1.0—the rule is always on scale. However, for non-cyclical non-spiral scales such as S, T, and LL's, the scale width is narrowed to make room for end margins. Circular slide rules are mechanically more rugged and smoother-moving, but their scale alignment precision is sensitive to the centering of a central pivot; a minute 0.1 mm off-centre of the pivot can result in a 0.2 mm worst case alignment error. The pivot, however, does prevent scratching of the face and cursors. The highest accuracy scales are placed on the outer rings. Rather than "split" scales, high-end circular rules use spiral scales for more complex operations like log-of-log scales. One eight-inch premium circular rule had a 50-inch spiral log-log scale. Around 1970, an inexpensive model from B. C. Boykin (Model 510) featured 20 scales, including 50-inch C-D (multiplication) and log scales. The RotaRule featured a friction brake for the cursor. The main disadvantages of circular slide rules are the difficulty in locating figures along a dish, and limited number of scales. Another drawback of circular slide rules is that less-important scales are closer to the center, and have lower precisions. Most students learned slide rule use on the linear slide rules, and did not find reason to switch. One slide rule remaining in daily use around the world is the E6B. This is a circular slide rule first created in the 1930s for aircraft pilots to help with dead reckoning. With the aid of scales printed on the frame it also helps with such miscellaneous tasks as converting time, distance, speed, and temperature values, compass errors, and calculating fuel use. The so-called "prayer wheel" is still available in flight shops, and remains widely used. While GPS has reduced the use of dead reckoning for aerial navigation, and handheld calculators have taken over many of its functions, the E6B remains widely used as a primary or backup device and the majority of flight schools demand that their students have some degree of proficiency in its use. Proportion wheels are simple circular slide rules used in graphic design to calculate aspect ratios. Lining up the original and desired size values on the inner and outer wheels will display their ratio as a percentage in a small window. They are not as common since the advent of computerized layout, but are still made and used. In 1952, Swiss watch company Breitling introduced a pilot's wristwatch with an integrated circular slide rule specialized for flight calculations: the Breitling Navitimer. The Navitimer circular rule, referred to by Breitling as a "navigation computer", featured airspeed, rate/time of climb/descent, flight time, distance, and fuel consumption functions, as well as kilometer—nautical mile and gallon—liter fuel amount conversion functions. A simple circular slide rule, made by Concise Co., Ltd., Tokyo, Japan, with only inverse, square, and cubic scales. On the reverse is a handy list of 38 metric/imperial conversion factors. A Russian circular slide rule built like a pocket watch that works as single cursor slide rule since the two needles are ganged together. A two-scale slide rule built into a ring. Pickett circular slide rule with two cursors. (4.25 in/10.9 cm width) Reverse has additional scale and one cursor. There are two main types of cylindrical slide rules: those with helical scales such as the Fuller, the Otis King and the Bygrave slide rule, and those with bars, such as the Thacher and some Loga models. In either case, the advantage is a much longer scale, and hence potentially greater precision, than afforded by a straight or circular rule. Traditionally slide rules were made out of hard wood such as mahogany or boxwood with cursors of glass and metal. At least one high precision instrument was made of steel. In 1895, a Japanese firm, Hemmi, started to make slide rules from bamboo, which had the advantages of being dimensionally stable, strong, and naturally self-lubricating. These bamboo slide rules were introduced in Sweden in September, 1933, and probably only a little earlier in Germany. Scales were made of celluloid, plastic, or painted aluminium. Later cursors were acrylics or polycarbonates sliding on Teflon bearings. All premium slide rules had numbers and scales engraved, and then filled with paint or other resin. Painted or imprinted slide rules were viewed as inferior because the markings could wear off. 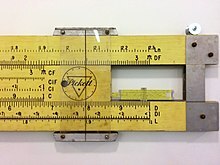 Nevertheless, Pickett, probably America's most successful slide rule company, made all printed scales. Premium slide rules included clever catches so the rule would not fall apart by accident, and bumpers to protect the scales and cursor from rubbing on tabletops. The recommended cleaning method for engraved markings is to scrub lightly with steel-wool. For painted slide rules, use diluted commercial window-cleaning fluid and a soft cloth. The slide rule was invented around 1620–1630, shortly after John Napier's publication of the concept of the logarithm. In 1620 Edmund Gunter of Oxford developed a calculating device with a single logarithmic scale; with additional measuring tools it could be used to multiply and divide. In c. 1622, William Oughtred of Cambridge combined two handheld Gunter rules to make a device that is recognizably the modern slide rule. Like his contemporary at Cambridge, Isaac Newton, Oughtred taught his ideas privately to his students. Also like Newton, he became involved in a vitriolic controversy over priority, with his one-time student Richard Delamain and the prior claims of Wingate. 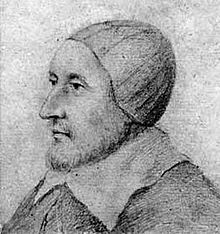 Oughtred's ideas were only made public in publications of his student William Forster in 1632 and 1653. In 1677, Henry Coggeshall created a two-foot folding rule for timber measure, called the Coggeshall slide rule, expanding the slide rule's use beyond mathematical inquiry. In 1722, Warner introduced the two- and three-decade scales, and in 1755 Everard included an inverted scale; a slide rule containing all of these scales is usually known as a "polyphase" rule. In 1815, Peter Mark Roget invented the log log slide rule, which included a scale displaying the logarithm of the logarithm. This allowed the user to directly perform calculations involving roots and exponents. This was especially useful for fractional powers. In 1821, Nathaniel Bowditch, described in the American Practical Navigator a "sliding rule" that contained scales trigonometric functions on the fixed part and a line of log-sines and log-tans on the slider used to solve navigation problems. In 1845, Paul Cameron of Glasgow introduced a nautical slide rule capable of answering navigation questions, including right ascension and declination of the sun and principal stars. A more modern form of slide rule was created in 1859 by French artillery lieutenant Amédée Mannheim, "who was fortunate in having his rule made by a firm of national reputation and in having it adopted by the French Artillery." It was around this time that engineering became a recognized profession, resulting in widespread slide rule use in Europe–but not in the United States. There, Edwin Thacher's cylindrical rule took hold after 1881. The duplex rule was invented by William Cox in 1891, and was produced by Keuffel and Esser Co. of New York. Astronomical work also required precise computations, and, in 19th-century Germany, a steel slide rule about two meters long was used at one observatory. It had a microscope attached, giving it accuracy to six decimal places.. Throughout the 1950s and 1960s, the slide rule was the symbol of the engineer's profession in the same way the stethoscope is that of the medical profession. German rocket scientist Wernher von Braun bought two Nestler slide rules in the 1930s. Ten years later he brought them with him when he moved to the U.S. after World War II to work on the American space effort. Throughout his life he never used any other slide rule. He used his two Nestlers while heading the NASA program that landed a man on the moon in July 1969. Aluminium Pickett-brand slide rules were carried on Project Apollo space missions. The model N600-ES owned by Buzz Aldrin that flew with him to the moon on Apollo 11 was sold at auction in 2007. The model N600-ES taken along on Apollo 13 in 1970 is owned by the National Air and Space Museum. Some engineering students and engineers carried ten-inch slide rules in belt holsters, a common sight on campuses even into the mid-1970s. Until the advent of the pocket digital calculator, students also might keep a ten- or twenty-inch rule for precision work at home or the office while carrying a five-inch pocket slide rule around with them. In 2004, education researchers David B. Sher and Dean C. Nataro conceived a new type of slide rule based on prosthaphaeresis, an algorithm for rapidly computing products that predates logarithms. However, there has been little practical interest in constructing one beyond the initial prototype. Slide rules have often been specialized to varying degrees for their field of use, such as excise, proof calculation, engineering, navigation, etc., but some slide rules are extremely specialized for very narrow applications. For example, the John Rabone & Sons 1892 catalog lists a "Measuring Tape and Cattle Gauge", a device to estimate the weight of a cow from its measurements. There were many specialized slide rules for photographic applications; for example, the actinograph of Hurter and Driffield was a two-slide boxwood, brass, and cardboard device for estimating exposure from time of day, time of year, and latitude. Specialized slide rules were invented for various forms of engineering, business and banking. These often had common calculations directly expressed as special scales, for example loan calculations, optimal purchase quantities, or particular engineering equations. For example, the Fisher Controls company distributed a customized slide rule adapted to solving the equations used for selecting the proper size of industrial flow control valves. Pilot balloon slide rules were used by meteorologists in weather services to determine the upper wind velocities from an ascending hydrogen or helium filled pilot balloon. In World War II, bombardiers and navigators who required quick calculations often used specialized slide rules. One office of the U.S. Navy actually designed a generic slide rule "chassis" with an aluminium body and plastic cursor into which celluloid cards (printed on both sides) could be placed for special calculations. The process was invented to calculate range, fuel use and altitude for aircraft, and then adapted to many other purposes. The E6-B is a circular slide rule used by pilots and navigators. Circular slide rules to estimate ovulation dates and fertility are known as wheel calculators. The TI-30 scientific calculator was introduced for under US$25 in 1976 ($110 adjusted for inflation), signaling the end of the slide rule era. Another step away from slide rules was the introduction of relatively inexpensive electronic desktop scientific calculators. The first included the Wang Laboratories LOCI-2, introduced in 1965, which used logarithms for multiplication and division; and the Hewlett-Packard HP 9100A, introduced in 1968. Both of these were programmable and provided exponential and logarithmic functions; the HP had trigonometric functions (sine, cosine, and tangent) and hyperbolic trigonometric functions as well. The HP used the CORDIC (coordinate rotation digital computer) algorithm, which allows for calculation of trigonometric functions using only shift and add operations. This method facilitated the development of ever smaller scientific calculators. As with mainframe computing, the availability of these machines did not significantly affect the ubiquitous use of the slide rule until cheap hand held scientific electronic calculators became available in the mid-1970s, at which point, it rapidly declined. The pocket-sized Hewlett-Packard HP-35 scientific calculator was the first handheld device of its type, but it cost US$395 in 1972. This was justifiable for some engineering professionals but too expensive for most students. By 1975, basic four-function electronic calculators could be purchased for less than $50, and, by 1976, the TI-30 scientific calculator was sold for less than $25. December 1951 advertisement for the IBM 604 Electronic Calculating Punch explicitly comparing electronic computers to engineers calculating with slide rules. Most people find slide rules difficult to learn and use. Even during their heyday, they never caught on with the general public. Addition and subtraction are not well-supported operations on slide rules and doing a calculation on a slide rule tends to be slower than on a calculator. This led engineers to use mathematical equations that favored operations that were easy on a slide rule over more accurate but complex functions; these approximations could lead to inaccuracies and mistakes. On the other hand, the spatial, manual operation of slide rules cultivates in the user an intuition for numerical relationships and scale that people who have used only digital calculators often lack. A slide rule will also display all the terms of a calculation along with the result, thus eliminating uncertainty about what calculation was actually performed. A slide rule requires the user to separately compute the order of magnitude of the answer in order to position the decimal point in the results. For example, 1.5 × 30 (which equals 45) will show the same result as 1,500,000 × 0.03 (which equals 45,000). This separate calculation is less likely to lead to extreme calculation errors, but forces the user to keep track of magnitude in short-term memory (which is error-prone), keep notes (which is cumbersome) or reason about it in every step (which distracts from the other calculation requirements). The typical arithmetic precision of a slide rule is about three significant digits, compared to many digits on digital calculators. 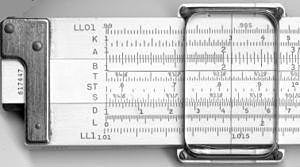 As order of magnitude gets the greatest prominence when using a slide rule, users are less likely to make errors of false precision. When performing a sequence of multiplications or divisions by the same number, the answer can often be determined by merely glancing at the slide rule without any manipulation. This can be especially useful when calculating percentages (e.g. for test scores) or when comparing prices (e.g. in dollars per kilogram). Multiple speed-time-distance calculations can be performed hands-free at a glance with a slide rule. Other useful linear conversions such as pounds to kilograms can be easily marked on the rule and used directly in calculations. Being entirely mechanical, a slide rule does not depend on grid electricity or batteries. However, mechanical imprecision in slide rules that were poorly constructed or warped by heat or use will lead to errors. Many sailors keep slide rules as backups for navigation in case of electric failure or battery depletion on long route segments. Slide rules are still commonly used in aviation, particularly for smaller planes. They are being replaced only by integrated, special purpose and expensive flight computers, and not general-purpose calculators. The E6B circular slide rule used by pilots has been in continuous production and remains available in a variety of models. Some wrist watches designed for aviation use still feature slide rule scales to permit quick calculations. The Citizen Skyhawk AT is a notable example. Even today, some people prefer a slide rule over an electronic calculator as a practical computing device. Others keep their old slide rules out of a sense of nostalgia, or collect them as a hobby. A popular collectible model is the Keuffel & Esser Deci-Lon, a premium scientific and engineering slide rule available both in a ten-inch (25 cm) "regular" (Deci-Lon 10) and a five-inch "pocket" (Deci-Lon 5) variant. Another prized American model is the eight-inch (20 cm) Scientific Instruments circular rule. Of European rules, Faber-Castell's high-end models are the most popular among collectors. Although a great many slide rules are circulating on the market, specimens in good condition tend to be expensive. Many rules found for sale on online auction sites are damaged or have missing parts, and the seller may not know enough to supply the relevant information. Replacement parts are scarce, expensive, and generally available only for separate purchase on individual collectors' web sites. The Keuffel and Esser rules from the period up to about 1950 are particularly problematic, because the end-pieces on the cursors, made of celluloid, tend to chemically break down over time. There are still a handful of sources for brand new slide rules. The Concise Company of Tokyo, which began as a manufacturer of circular slide rules in July 1954, continues to make and sell them today. In September 2009, on-line retailer ThinkGeek introduced its own brand of straight slide rules, described as "faithful replica[s]" that are "individually hand tooled". These are no longer available in 2012. In addition, Faber-Castell has a number of slide rules still in inventory, available for international purchase through their web store. Proportion wheels are still used in graphic design. Various slide rule simulator apps are available for Android and iOS-based smart phones and tablets. Specialized slide rules such as the E6B used in aviation, and gunnery slide rules used in laying artillery are still used though no longer on a routine basis. These rules are used as part of the teaching and instruction process as in learning to use them the student also learns about the principles behind the calculations, it also allows the student to be able to use these instruments as a back up in the event that the modern electronics in general use fail. Wikimedia Commons has media related to Slide rules. ^ Berrey, Lester V.; van den Bark, Melvin (1953). American Thesaurus of Slang: A Complete Reference Book of Colloquial Speech (2nd ed.). Crowell. 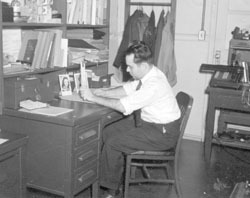 OCLC 319462. ^ Petroski, Henry (2011). An Engineer's Alphabet: Gleanings from the Softer Side of a Profession. Cambridge University Press. pp. 46–47. ISBN 9781139505307. Retrieved 21 March 2017. ^ Peter Grego (2009). Astronomical cybersketching. Springer. p. 12. Bibcode:2009acod.book.....G. ISBN 978-0-387-85351-2. Retrieved 30 March 2013. It is astonishing to think that much of the routine mathematical work that put people into orbit around Earth and landed astronauts on the Moon in the 1960s was performed using an unassuming little mechanical analog computer – the 'humble' slide rule. ^ Harry Henderson (1 January 2009). 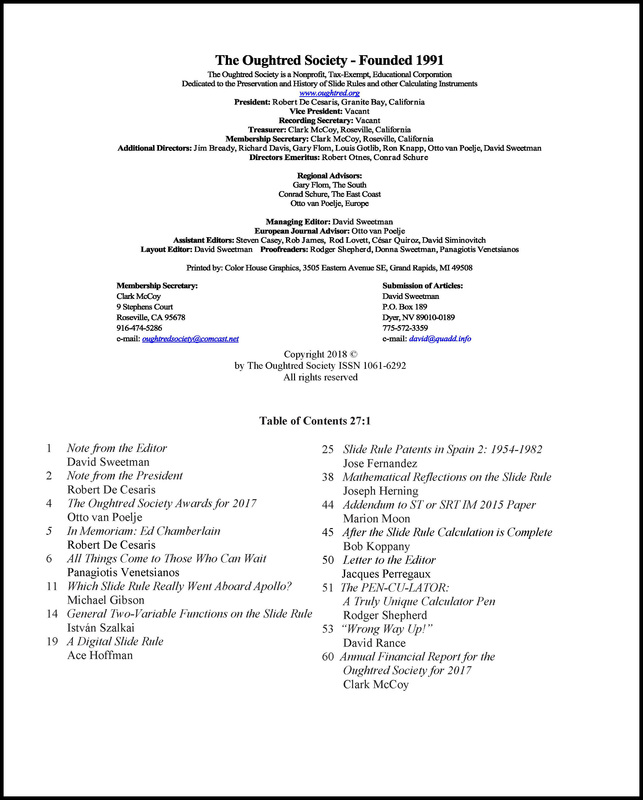 Encyclopedia of Computer Science and Technology, Revised Edition. Infobase Publishing. p. 13. ISBN 978-1-4381-1003-5. Retrieved 30 March 2013. Another analog computer, the slide rule, became the constant companion of scientists, engineers, and students until it was replaced ... logarithmic proportions, allowing for quick multiplication, division, the extraction of square roots, and sometimes the calculation of trigonometric functions. ^ Maor, Eli (2009). e: The Story of a Number. Princeton University Press. p. 16. ISBN 978-0-691-14134-3. Then in the early 1970s the first electronic hand-held calculators appeared on the market, and within ten years the slide rule was obsolete. ^ Castleden, Rodney (2007). Inventions that Changed the World. Futura. p. 157. ISBN 978-0-7088-0786-6. With the invention of the calculator the slide rule became instantly obsolete. ^ Denning, Peter J.; Metcalfe, Robert M. (1998). Beyond calculation: the next fifty years of computing. Springer. p. xiv. ISBN 978-0-387-98588-6. The first hand calculator appeared in 1972 and made the slide rule obsolete overnight. ^ "instruction manual". sphere.bc.ca. pp. 7–8. Retrieved March 14, 2007. ^ "AntiQuark: Slide Rule Tricks". antiquark.com. ^ "Slide Rules". Tbullock.com. 2009-12-08. Retrieved 2010-02-20. ^ At least one circular rule, a 1931 Gilson model, sacrificed some of the scales usually found in slide rules in order to obtain additional resolution in multiplication and division. It functioned through the use of a spiral C scale, which was claimed to be 50 feet and readable to five significant figures. See http://www.sphere.bc.ca/test/gilson/gilson-manual2.jpg. A photo can be seen at http://www.hpmuseum.org/srcirc.htm. An instruction manual for the unit marketed by Dietzgen can be found at http://www.sliderulemuseum.com/SR_Library_General.htm. All retrieved March 14, 2007. ^ "336 (Teknisk Tidskrift / 1933. Allmänna avdelningen)". Runeberg.org. Retrieved 2010-02-20. ^ Smith, David E. (1958). History of Mathematics. Courier Corporation. p. 205. ISBN 9780486204307. ^ Applebaum, Wilbur (2003-12-16). "Slide Rule". Encyclopedia of the Scientific Revolution: From Copernicus to Newton. Routledge. Bibcode:2000esrc.book.....A. ISBN 9781135582555. ^ Kells, Lyman M.; Kern, Willis F.; Bland, James R. (1943). The Log-Log Duplex Decitrig Slide Rule No. 4081: A Manual. Keuffel & Esser. p. 92. Archived from the original on 14 February 2009. ^ The Polyphase Duplex Slide Rule, A Self-Teaching Manual, Breckenridge, 1922, p. 20. ^ The first pocket calculator that could replace the slide rule was the HP35 introduced in 1972. ^ "Lot 25368 Buzz Aldrin's Apollo 11 Slide Rule - Flown to the Moon. ... 2007 September Grand Format Air & Space Auction #669". Heritage Auctions. Retrieved 3 September 2013. ^ "Slide Rule, 5-inch, Pickett N600-ES, Apollo 13". Smithsonian National Air and Space Museum. Retrieved 3 September 2013. ^ Charles Overton Harris, Slide rule simplified, American Technical Society, 1961, p. 5. ^ "Prosthaphaeretic Slide Rule: A Mechanical Multiplication Device Based On Trigonometric Identities, The | Mathematics And Computer Education | Find Articles At Bnet". Findarticles.com. 2009-06-02. Archived from the original on 2005-05-10. Retrieved 2010-02-20. ^ "Fisher sizing rules". natgasedu.com. Archived from the original on 6 January 2010. Retrieved 2009-10-06. ^ "Pilot Balloon Slide Rules". www.pilotballoon.com. Archived from the original on 2016-09-28. Retrieved 28 September 2016. ^ Ross, M. G. (2003). "Circle of time: errors in the use of the pregnancy wheel". Journal of Maternal-Fetal and Neonatal Medicine. 14 (6): 370–372. doi:10.1080/14767050412331312200. PMID 15061314. ^ "The Wang LOCI-2". oldcalculatormuseum.com. ^ Wang Laboratories (December 1966). "Now you can determine Copolymer Composition in a few minutes at your desk". Analytical Chemistry. 38 (13): 62A–63A. doi:10.1021/ac50155a005. ^ Volder, Jack E. (June 2000). "The Birth of CORDIC" (PDF). Journal of VLSI Signal Processing. 25 (2): 101–105. doi:10.1023/a:1008110704586. ISSN 0922-5773. Archived from the original (PDF) on 2016-03-04. Retrieved 2016-01-02. ^ Stoll, Cliff. "When Slide Rules Ruled," Scientific American, May 2006, pp. 80–87. "The difficulty of learning to use slide rules discouraged their use among the hoi polloi. Yes, the occasional grocery store manager figured discounts on a slipstick, and this author once caught his high school English teacher calculating stats for trifecta horse-race winners on a slide rule during study hall. But slide rules never made it into daily life because you could not do simple addition and subtraction with them, not to mention the difficulty of keeping track of the decimal point. Slide rules remained tools for techies." ^ Watson, George H. "Problem-based learning and the three C's of technology," The Power of Problem-Based Learning, Barbara Duch, Susan Groh, Deborah Allen, eds., Stylus Publishing, LLC, 2001. "Numerical computations in freshman physics and chemistry were excruciating; however, this did not seem to be the case for those students fortunate enough to already own a calculator. I vividly recall that at the end of 1974, the students who were still using slide rules were given an additional 15 minutes on the final examination to compensate for the computational advantage afforded by the calculator, hardly adequate compensation in the opinions of the remaining slide rule practitioners." ^ Stoll, Cliff. "When Slide Rules Ruled," Scientific American, May 2006, pp. 80–87. "With computation moving literally at a hand's pace and the lack of precision a given, mathematicians worked to simplify complex problems. Because linear equations were friendlier to slide rules than more complex functions were, scientists struggled to linearize mathematical relations, often sweeping high-order or less significant terms under the computational carpet. So a car designer might calculate gas consumption by looking mainly at an engine's power, while ignoring how air friction varies with speed. Engineers developed shortcuts and rules of thumb. At their best, these measures led to time savings, insight and understanding. On the downside, these approximations could hide mistakes and lead to gross errors." ^ Stoll, Cliff. "When Slide Rules Ruled", Scientific American, May 2006, pp. 80–87. "One effect was that users felt close to the numbers, aware of rounding-off errors and systematic inaccuracies, unlike users of today's computer-design programs. Chat with an engineer from the 1950s, and you will most likely hear a lament for the days when calculation went hand-in-hand with deeper comprehension. Instead of plugging numbers into a computer program, an engineer would understand the fine points of loads and stresses, voltages and currents, angles and distances. Numeric answers, crafted by hand, meant problem solving through knowledge and analysis rather than sheer number crunching." ^ "Citizen Watch Company – Citizen Eco-Drive / US, Canada, UK, IrelandCitizen Watch". citizenwatch.com. 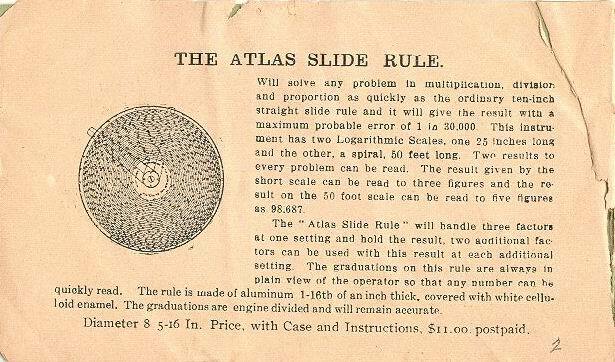 ^ "Greg's Slide Rules - Links to Slide Rule Collectors". Sliderule.ozmanor.com. 2004-07-29. Retrieved 2010-02-20. ^ "About CONCISE". Concise.co.jp. Archived from the original on 2012-03-12. Retrieved 2010-02-20. ^ "Slide Rule". ThinkGeek. Archived from the original on 2010-03-27. Retrieved 2015-04-08. ^ "Slide Rule". ThinkGeek. Archived from the original on April 15, 2012. Retrieved 2015-04-08. ^ "Rechenschieber". Faber-Castell. Archived from the original on 2013-11-21. Retrieved 2012-01-17. ^ Istvan, Szalkai (2016). "General Two-Variable Functions on the Slide Rule". Journal of the Oughtred Society. 27 (1): 14–18. arXiv:1612.03955. Bibcode:2016arXiv161203955S. ^ Istvan, Szalkai (2016). "General Two-variable Functions on the Slide-rule". arXiv:1612.03955 [math.HO]. "Slide rule" . New International Encyclopedia. 1905. "Slide-rule" . Encyclopedia Americana. 1920.